Mood board: Albert Kriemler’s recent trip to Africa inspired the deep, earthy, strata reds used for his autumn collection at Akris. 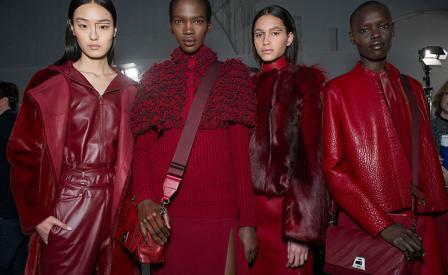 The designer rightly enthused that ’red is everything from orange to aubergine’ and this expansive, but cohesive palette gave the clothes a thumping heart. Best in show: Though Kriemler played around with zebra and leopard prints, his best pieces were dead simple silhouettes, in weighty wools or cashmeres, and completely print free. These included the marvellous double faced two tone capes, cloaks and coats, as well as his whole series of rich velvets. Finishing touches: Nearly every look was accompanied by a straight heel, knee high boots with a rugged sole. Many were in bright orange, a zesty counterpoint to Kriemler’s signature folded trapeze bag now offered in orange ostrich skin.